The Euro benefited from the US Dollar’s weakness as US economic data disappointed, with December Housing Starts collapsing 11.2%, and the Atlanta Fed's GDP estimate revised to 1.8% ahead of the official Q4 estimate. Moreover, Chairman Powell testified before a Senate special committee on monetary policy reiterating a “patient” stance, further denting the dollar’s demand across the board. But the Single currency’s advance was relatively weak as concerns about slowing economic growth in the Union kept the Euro's gains at check. Today, the EU will release the M3 Money Supply data and the February Economic Sentiment Indicator, expected at 106.0 vs. the previous 106.2. While the US will release December Trade Balance, January Durable Goods Orders, and Pending Home Sales. The Euro bulls tested 1.14 (R1) yesterday a major resistance level. 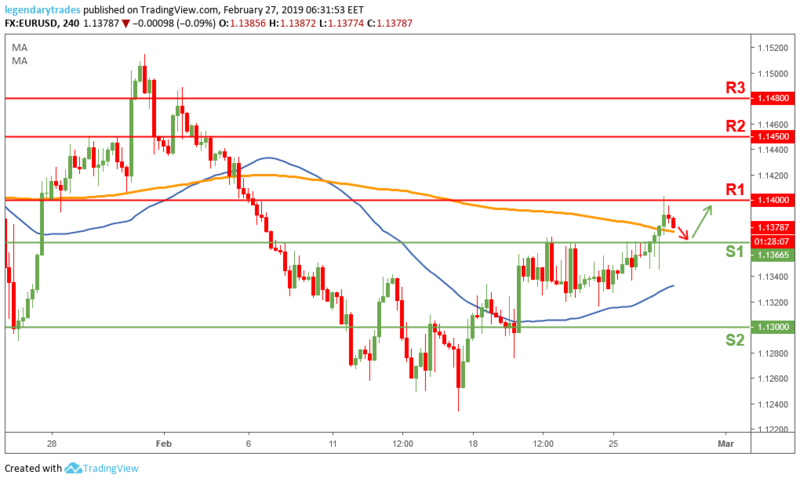 The buyers need to protect 1.1365 (S1) to stay in control of this current short-term up trend. A break above 1.14 (R1) could take the price towards 1.1450 (R2) and possibly even further. Alternatively, if 1.1365 (S1) is lost, then further weakness towards 1.13 will be on the cards.